GLOBAL ATTRACTIVITY IN A LOGISTIC GROWTH MODEL WITH A FEEDBACK AND SEVERAL DELAYS LIAO LiuSheng, WANG Xiaoping, WANG Lin Department of Mathematics, Chenzhou Teacher's College, Chenzhou 423000, China. E-mail: llsw-56@163.com Department of Applied Mathematics, Hunan University Changsha 410082, China. ANALYTIC EXPANSION OF SOLUTION PASSING SINGULAR POINT OF SECOND ORDER POLYNOMIAL SYSTEM LEI Jinzhi, GUAN Keying Department of Mathematics, Beijing University of Aeronautics and Astronautics, Beijing 100083, China. E-mail: jzhlei@263.net Department of Mathematics, Northern Jiaotong University, Beijing 100044, China. THE REACTION DIFFUSION EQUATIONS WITH SPECIAL DIFFUSION PROCESSES TAN Zhong Department of Mathematics, Xiamen University Xiamen 361005, China. 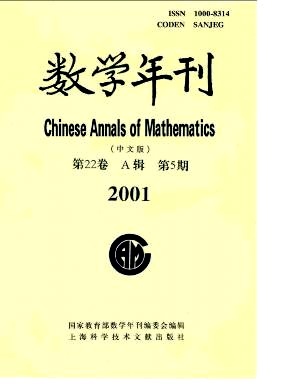 ISHIKAWA TYPE ITERATIVE SEQUENCES WITH ERRORS FOR LIPSCHITZIAN STRONGLY PSEUDOCONTRACTIVE MAPPINGS IN BANACH SPACES ZENG Luchuan Department of Mathematics, Shanghai Normal University Shanghai 200234, China. A REMARK ON HYPERBOLIC SPACE FORM CHEN ZHIHUA, ZHUO Chaohui Department of Applied Mathematics, Tongii University Shanghai 200092, China.E-mail: zzzhhc@online.sh.cn Basic Department, Shanghai Institute of Electric Power, Shanghai 200090, China. THE CHARACTERIZATIONS OF BIORTHOGONALITY OF SCALING FUNCTIONS WITH AN ARBITRARY DILATION MATRIX LI Dengfeng Department of Mathematics, Henan University, Kaifeng 475001, China; National Mobile Communications Research Laboratory Southeast University, Nanjing 210096, China.